In the report (2007), where I found the curve shown above, the authors discuss the causes for the collapse of the fishery, especially in view of climate change. They don't seem to arrive to any definitive conclusion and they don't use the dreaded term "overfishing". But from the fact that trawlers were used in this fishery, I think it is clear that the fish stock was being destroyed in a process similar to the one that led to the collapse of the whole UK fishing industry. The more resources were aggressively thrown at trying to maintain production, the more the fish stock was depleted. The end result was the rapid collapse observed. So, as in several other cases, we have a classic example of the "Seneca Collapse", that is a production curve where decline is much more rapid than growth. Below, you can see the Seneca curve as shown in a simulation carried out by system dynamics that takes into account the increased capital expenditure in fishing equipment (the model is described here). As Seneca said, "the road to ruin is rapid", indeed. In the song "Susann" by Toni Vescoli (people in Germany might recall the cover version by Reinhard Mey), a young woman, fed up with her boring life in the countryside, decides to move to the city. She gets herself a job and becomes a true and content city dweller. Until, one day, her boyfriend comes home with a triumphant smile and declares that his lifetime dream has finally come true: he has bought a farmhouse and they will move there to escape this dull city life! This sums up nicely the universal pattern of modern life: we want change. It is not so much a question of where we are or whether life is good. After a while, we get bored and want to move on. Our dissatisfaction is growing and we start to dream of a different and of course better world, where all our problems simply do not exist.Every dream that we have can turn into an obsession — which lasts until the dream comes true. Reinhold Messner in one of his darker moments said that every mountain conquered is a dream gone forever. The same holds true of societies as a whole. They dream about the future and what it will bring them. 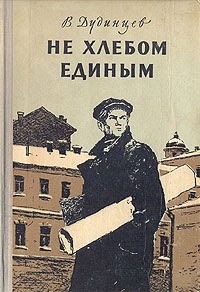 A hundred years ago, for example, future was hoped to end diseases, hard labour, poverty, and hunger. Mankind would excel not only in arts, but also in science. And we would travel not only anywhere on earth but eventually also go into space. Only that once these dreams came true, we got to see the other side of them, too. Some hundred years ago, longevity had been a dream. Today we hear about a growing problem of Alzheimer or similar diseases of the ageing body. Or we see people lying in hospital connected to ever more machines. To live on is not always a dream come true. It may for some also be a nightmare. Or think about the space that we have given to cars so that they can move us where we want to go. When I was a child, there was hardly a car around in our little street, and we roamed the street on roller skates. Today, this same street is filled with cars. So many, that they can't even get past each other on encounter. And there are no children. When the dreams are no longer there or have turned into nightmares, when the people do not know what to really aspire for the first that happens is that there no longer is a desire by the next generation to learn anything. Because what would be the result of learning? What is the direction they should take if we don't know it ourselves? Indeed, this is our great dilemma. While we have lost direction ourselves, we wish for the next generation to find out where to go. We see what we have done, and we ask ourselves: was it worth the effort? We see what the world has become and we ask: where is the future? But the next generation cannot be the future if we do not do out part. I have long thought that today's children have stopped learning because of the affluence. Or because of the long term effects of a libertarian society (as Plato proposed). But now I think that affluence isn't what has stopped them. Young children are still eager to learn. It is not until they reach a certain age when they change their mind about their goals. One may think: maybe it is just an effect of adolescence. But remember the desire for learning used to return once the problems in our heads got sorted out. Because when we understood our place in society there were signs and directions all around us. They said: study hard, become a scientist, a programmer, a doctor, and life will be very interesting. Not only will you get a job, it will also be interesting, useful, and rewarding. They said: practice an instrument and you can perform music. You can become popular, even famous. They said: if you want and work for it, there will be a place for you. That is no longer true. Not only are the dreams failing us. There are no true dreams left. We are dropping them one by one. It happens to all of us. But we don't like to talk about it. Why become a scientist if all science does is prepare the ground for the destruction of the planet? Name one invention that has not been perverted to make money rather than being used for the benefit of mankind. It doesn't have to be genetics or nuclear physics. Anything, I repeat: anything, is being turned into money. And nothing besides that is left to dream of. Who is dreaming of playing music? Who is dreaming of becoming a singer (as opposed to becoming rich and famous)? Who is in it for the beauty? Or take foreign languages. What is the point of learning any language other than English? When people talk about internationalisation what they really mean is: Anglicization. Because that is what you need to make a living. Give English names to things and you are there. You are international. Foreign languages are no longer important in themselves or as a means to understand other cultures, but as a means of being economically successful. Which leaves more or less one language worth the effort of learning it. Or take machines. Of course, we need engineers to make them. But where is the attitude that engineering is actually fun? It is gone. And, really, most factories are dead places. Full of robots. Sure, they need designing, but that too is increasingly a sterile job. The engineer hardly gets to touch the thing he is making. Instead, he is assembling them behind a screen, like a programmer. Not to speak of programming itself. That too has become more of an assembly-line job. The spirit's gone. And so the students arrive at university without dreams except for a single one: to get a diploma so that they can get a job — and make money. And why shouldn't they want that if this is what society tells them to do? The belief that society values science is pure hallucination. It values only the money that the science is asked to deliver. Why else are universities under constant threat to get in money regardless of the content of the research? Why do the criteria of success for German universities talk about anything but content? Think this: the majority of people in Europe (and, as I read somewhere, also in the US) do not want genetically modified food. And yet they are being told that they have to accept it. And they are told that they have to accept it because there is no scientific proof of its adverse effects. As if it were a simple matter to stop this food once we know what these effects are. This is not only hard to accept in a democratic society. My question is: why do all this science, then? Apparently it is not being done so that in the end society gets to choose and say what it really wants to have. It is there for certain institutions to make money from it. Pure and simple. It means that if you are against the abuse of science your only safe bet is not to become a scientist. The logic of money is everwhere. Is it not natural that students say: I am doing all this to make money, all I want from my degree is a job? If we want them to change their minds, we should change ours first. But we are not. Instead we are dabbling on about changing the learning habits. Different recipes have been tried to stem the tide. In the US, rising costs have led to fee hikes, and students are more and more in debt. Which will focus their attention even more on the question of where the money is in their education. In Europe, one has tried to standardise education. Students get credit points, which supposedly are uniform in value. Universities however are subjected to a quasi-market oriented regime where they get part of their funding according to performance. Performance in turn is measured by some bureaucratic numbers. In Germany they are: number of first degrees, amount of extra mural funding, and progress in equal oportunity hiring. None are about content or quality of teaching. None of these approaches have worked. It is not because the students are protesting. They in fact are very polite. But typically they are absent minded. The content is not what they are in for. They are asking: what do I have to know to pass the exam? The politicians and presidents of the universities alike talk about performance but they hardly mean content. They mean money. In other areas of life you call that prostitution. It results in getting a mere substitute for what you really want. Because what you really want you cannot get by paying money. Motivation is a primadonna. It is not singing when you want it to. It disappears once you start asking too loudly for it. If I want my students to listen, I need to give them a story of why it makes sense to do what I am doing. Why I am doing it despite everything. But not only the students need dreams to carry on. All of us need them. I need to have a dream as well. I need to know why I am doing what I am doing. Increasingly however I am getting tired. The administration is turning academic life into a madhouse. We get no time to think, because that is something that can't be measured. No credit points for thinking. And we are losing hope that the next generation will have any chances to get a meaningful job in society let alone at a university. Higher education is at a crossroads, really. It needs money, and the money isn't there. To cover that up, they are making up excuses. That's it. 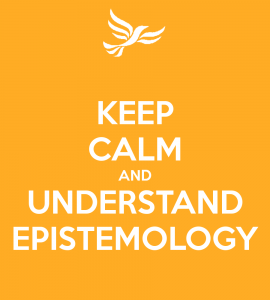 Increasingly, I see myself doing research not for a future generation (who would that be?) but for the people with whom I went to university. Because there hardly is a next generation. Jobs are being cut, university life is being stripped down to the barest necessities. The propaganda has it that there is less money because people aren't working hard enough, but that's not how the bureaucratic machine functions. Remember that awards are relative: you get more if you are better than the rest. If everyone works more, you have to work more just to stay even with them. And if they start working less, then less work on your part will also do. Universities will become marginalised. Already the discussion of what its role in society is or should be is nonexistent. Because interference with politics is not desired. Intellectuals do not appear in television for fear that what they will be saying is too difficult. Their role is not any more to come up with a beautiful story but to get money in. So universities turn into private companies for funding. And the state nods in agreement. The dream of learning has disappeared from higher education. Yes, more and more students enroll in first tier institutions (high schools, universities), but less and less of them do it because they want to learn. Call that realism. I call it a wasted chance. At one point the money will be so scarce that they start closing down universities. And we get to see the other side of Big Education. The graph above refers to effects of the illegal hunting of African elephants. It is taken from a recent paper by Wittemyer et al. Once you have given a name to a phenomenon and understood its causes, you can use it as a guide to understanding many other things. So, the concept of the "Seneca Cliff" tells us that the overexploitation of natural resources often leads to an abrupt decline that, often, takes people by surprise. In the case of biological resources, such as fisheries, the decline may be so fast and uncontrollable that it leads to the extinction or to the near extinction of the species being exploited. It has happened, for instance, for whales in 19th century and for the Atlantic cod. If you keep in mind these historical examples, you can examine other cases and identify possible Seneca cliffs in the making. One such case is the ivory trade from the hunting of African elephants. 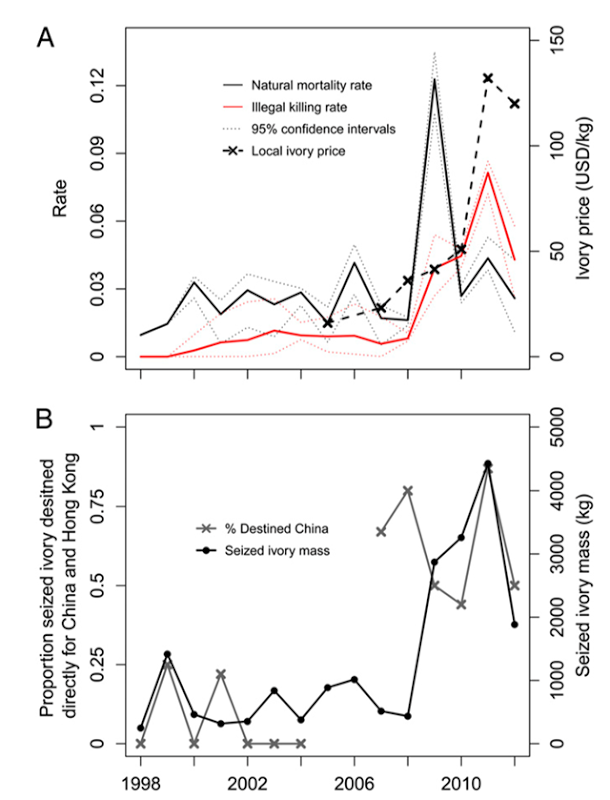 If you look at the plots (from a recent paper), above, you see that the seized ivory mass has shown a considerable increase starting around 2008. It peaked in 2011, then declined. We can probably take these numbers as a "proxy" for the number of African elephants being killed - which is also visible as the red line in the upper box. 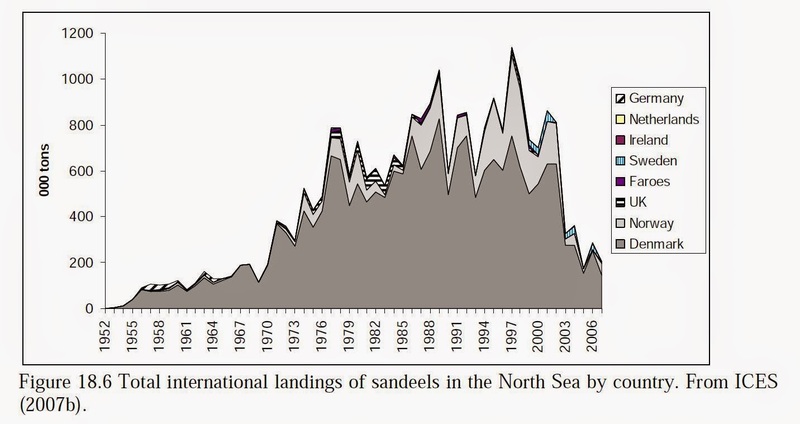 This is very worrisome, because if killings decline, it may very well be because there are fewer elephants left to kill - just as the landings of the fishing industry tend to decline when the fish stocks are depleted. Considering how abruptly these things go (the "Seneca effect") then we may well be seeing a similar trend in progress for African elephants: that is, the prelude of an abrupt crash in their numbers. Considering that elephants are big and reproduce slowly, that may very well lead to their extinction. Are we going to lose the elephants forever? Right now, we can't say for sure; but when it will be clear that it is happening, it will probably be too late to do something about it. Doesn't that sound familiar? Results of a Google Ngrams search for the term "novel"
In a previous post titled "Where have our dreams gone? ", I argued that literature, as well as other forms of art, has declined starting with the 1980s, losing impact and interest in our society. This, of course, can only be a qualitative evaluation and it was challenged in some of the comments. Indeed, terms such as "impact" and "interest" can only be defined in qualitative terms and there is plenty of space for different interpretations. Nevertheless, I did some experimenting on google's "Ngrams" and I think that my interpretation is shared by many others. You can see in the figure above, showing a clear peak for the term "novel" (*), around 1990 indicating a decline of interest in novels. Also this result is debatable, of course, but I think it does tell us something about the general cultural decline of our civilization. (*) One problem with this search is that the term "novel" in English may also be an adjective, but the peak is visible also with unambiguous terms such as "novelist" and "novel", although in both cases it appears earlier. Also, in Italian, the term "romanzo" for "novel" is unambiguous, and it shows a similar peak - even clearer - as for "novel" in English. Seneca's pyramids: how fast did the Mayan civilization fall? Monument building cycle of the Mayan civilization. From "Sylvanus G. Morley and George W. Brainerd, The Ancient Maya, Third Edition (Stanford University Press, 1956), page 66.". Courtesy of Diego Mantilla. Here, you can see the the Seneca behavior, although the data for the Maya population density seem to be rather qualitative and uncertain. 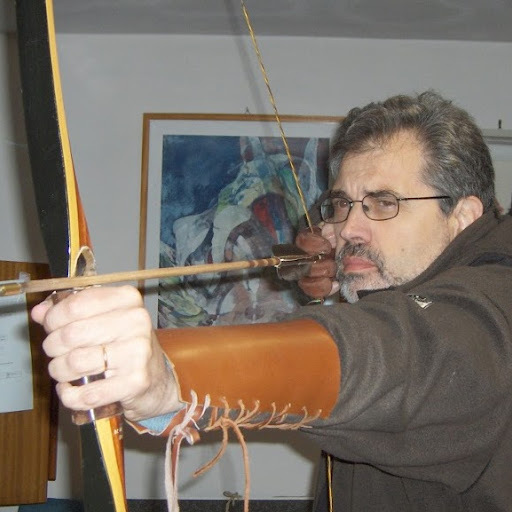 However, the data that I received recently from Diego Mantilla (see at the beginning of this post) are clear: if you take monument building as a proxy for the wealth of the Mayan civilization, then the collapse was abrupt, surely faster than growth. Something similar can be said for the ancient Egyptians, although the data for pyramid building are more sparse and uncertain than those for the Maya. Finally, also the Roman civilization appears to have collapsed faster than it grew. So, the Mayans didn't do better than other civilizations in human history. As other civilizations did, they moved toward their demise by dragging their feet, trying to avoid the unavoidable. They didn't succeed and they didn't realize that opposing the collapse in this way is a classic example of "pushing the levers in the wrong direction". It can only postpone collapse, but in the end makes it more rapid. (*) Dunning, N., D. Rue, T. Beach, A. Covich, A. Traverse, 1998, "Human - Environment Interactions in a Tropical Watershed: the Paleoecology of Laguna Tamarindito, Guatemala," Journal of Field Archaeology 25 (1998):139-151. The oil price collapse: did the Saudis make a smart move? As far as Saudi Arabia and its motives, that is very simple also. The Saudis are good at money and arithmetic. Faced with the painful choice of losing money maintaining current production at $60/barrel or taking 2 million barrels per day off the market and losing much more money—it’s an easy choice: take the path that is less painful. If there are secondary reasons like hurting U.S. tight oil producers or hurting Iran and Russia, that’s great, but it’s really just about the money. I think that Berman may very well be right; the Saudi really reasoned in these terms. They wanted to reduce their losses and keep their market share. But think about that for a moment: was it really a smart move for the Saudis? 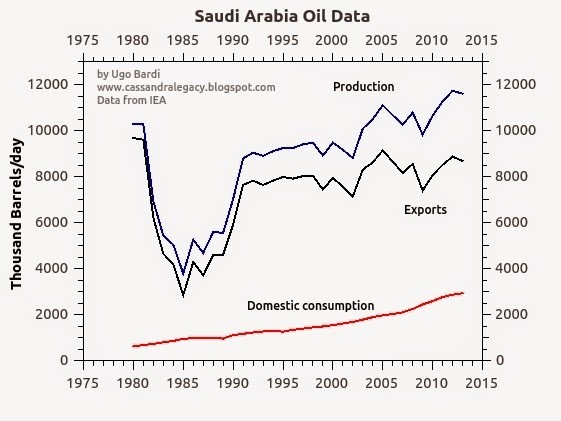 Saudi Arabia produces little in addition to oil; its economy is heavily based on oil. And even for food, Saudi Arabia must rely on revenues from oil in order to import food. And even for the mighty Saudi Arabia, oil resources are not infinite. So, assume you have the power to regulate oil production in Saudi Arabia, what would you do? Logically, you would think that it is silly to keep pumping oil at full speed when it has become so cheap. You would reason that it is a good idea to keep as much as possible of it underground, to use when it will be really rare and expensive. In addition, your competitors will run out of oil when you still have plenty of it; wouldn't that be nice? Logic? Sure, but only if you think long term. If you think only of the near term profit, then it makes sense to sell all what you have, when you have it. And the future? Well, that will be someone else's problem. Unfortunately, it is not just in Saudi Arabia that they think in this way. 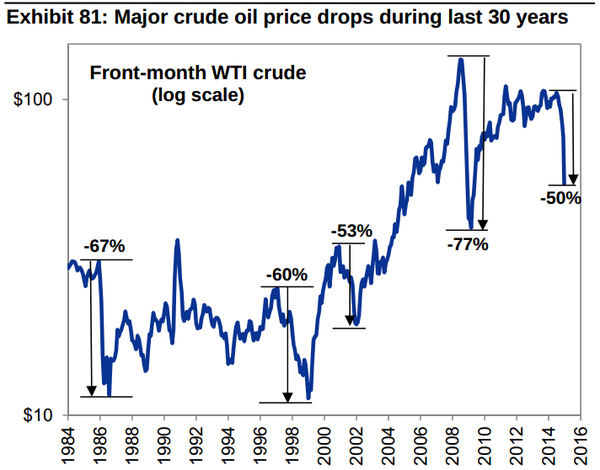 The oil price collapse: what's so special about it? As I said in a previous post of mine, strong price oscillations are expected at or near the production peak. Prices can go up and down, but the drops don't last for long and the overall trend is clear: it goes up. Graph by Frances Coppola. 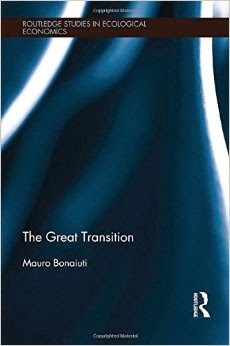 "The Great Transition", a recent book by Mauro Bonaiuti; an economist, presently teaching at the University of Torino, in Italy. With this book, he tackles several themes well known to those who study the interplay of resource depletion, pollution, and economic growth (and de-growth). Among these, the effects of overpopulation, decline in EROEI, environmental degradation and more. He adds, however, the economist's point of view in examining how the economy of a post-growth society could be organized. The book has been extensively reviewed by Nafeez Ahmed. Here are some excerpts from Ahmed's article; you can read the whole text on "Motherboard"
Some argue that even as the economy descends into madness, the seeds of hope are being planted. Even as global crises are accelerating—encompassing the risk of climate catastrophe, energy instability, and many others in addition to economic breakdown—a range of interconnected systemic revolutions are converging in a way that could facilitate a positive transformation of the global economy: from one that maximizes material accumulation for the few, to one that caters for the needs and well being of all. That’s the conclusion of a major new book published as part of the Routledge Studies in Ecological Economics series, The Great Transition, by Mauro Bonaiuti, an economist at the University of Turin in Italy. Bonaiuti’s book applies the tools of complexity science to diagnose the real dynamic and implications of the global economic crisis that most visibly erupted in 2008. That crisis, Bonaiuti argues, is a symptom of a longer “passage of civilization.” Advanced capitalist societies are in a “phase of declining returns” measured across the period after the Second World War, including GDP growth, energy return on investment (how much energy is put in compared to what we get out), and manufacturing productivity, among others. Bonaiuti’s graph of GDP growth rate in Europe from 1961 to 2011, illustrating a fluctuating but consistent long decline. Despite the very real disru​ptions this phase shift entails, many of which have been explored in depth here at Motherboard (the unprecedented spate of global unrest being a major example), the Italian economist is cautiously optimistic about the potential long-term outcomes. If Bonauiti is right, then even as conventional economic tools turn out to be increasingly impotent, we should expect to see more and more signs of this changing framework, and with it, the emergence of potential new forms of economic and social organization that work far better than the old industrial paradigm we take for granted. That’s not to say any of this will happen in a simplistic, easy-peasy manner. Bonauiti identifies four potential scenarios for the future, and one of them involves “collapse”—which somewhat speaks for itself. Those who benefit from the old paradigm are likely to resist the most. Quite literally, the future of our species and the planet will be defined by the entirely unpredictable way people everywhere might respond to the reality of change, whether through resistance, disbelief, apathy, engagement, adaption, or action. So welcome to 2015: a year when our choices could determine the future of the planet. All parts of our economy are interconnected. If parts of the economy is becoming increasingly inefficient, more than the cost of production in these parts of the economy are affected; other parts of the economy are affected as well, including wages, debt levels, and interest rates. At some point, something has to “give”. Which is a good description of the mathematical model at the basis of the Seneca cliff idea. The burden on the economy of increasing costs becomes more and more heavy in times of diminishing returns (or, as Gail says, increasing inefficiency, which is the same). At some point, something "gives" and the whole thing comes down. Seneca rules. Image from a 2010 article by Thurstan, Brockington, and Roberts. It describes the cycle of the UK fishing industry, which collapsed because of overfishing in the late 1970s. 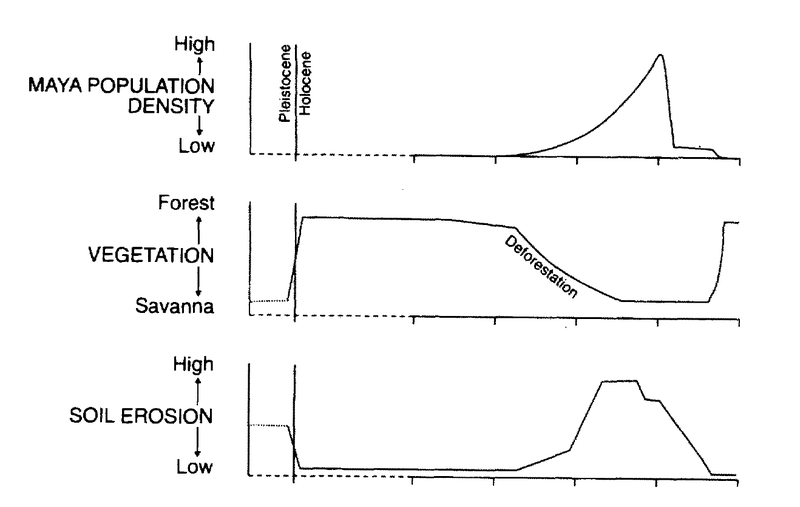 The two graphs above (from a 2010 article by Thurstan et al.) speak by themselves. We have here a real life example of the overexploitation of natural resources; that is, of the tendency of people of destroying their own sources of wealth. Other classic examples can be found with the 19th century whaling industry and with the Canadian cod fishery. 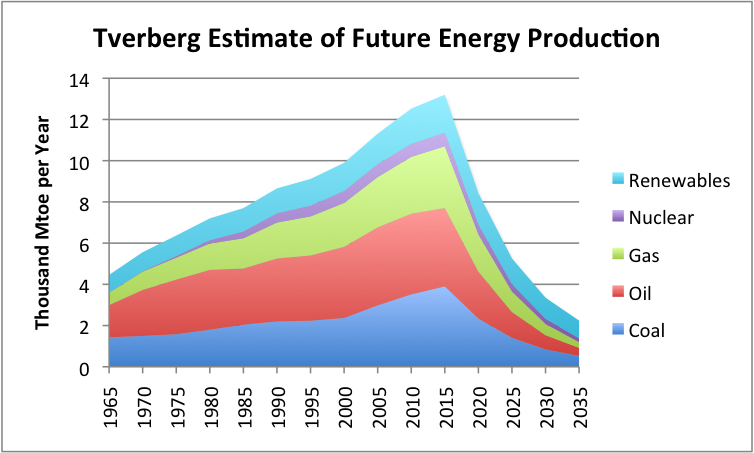 Overexploitation typically generates the "Hubbert curve," the name given to a bell-shaped production cycle best known for the case of crude oil, but affecting all the resources which can be exploited faster than they can reform by natural processes. This behavior can be explained by means of mathematical models, but, qualitatively, it is the result of the falling profits generated by the diminishing resource stock. In the long run, lower profits discourage investments and the result is a general production decline. A particular case of this mechanism is when the industry initially reacts to diminishing returns by aggressively increasing the amount of capital invested. In this case, the stocks of the resource are depleted very fast and the result is a crash of the production rate; we still have a bell shaped curve, but skewed forward. 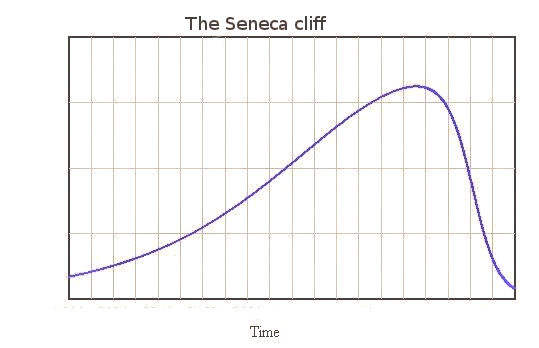 The rapid decline that occurs after the peak is what I called the "Seneca Cliff." There are several historical examples of the Seneca cliff; in the case of fisheries, it is especially evident in the case of the Canadian cod fishery and for the Caspian Sturgeon; but it is evident also in the case of the UK fishing industry. Note, in the figure above, the steep decline of the landings of the late 1970s, it is significantly steeper than the growth of the left side of the curve. This is the essence of the Seneca mechanism. And we can see very well what causes it: the start of the decline in production corresponds to a rapid growth of investments. The result is the increase of what the authors of the paper call "fishing power" - an estimate of the efficiency and size of the fishing fleet. The results were disastrous; a textbook example of how to "push the levers in the wrong directions", that is, of a case when the attempt to solve a problem worsens it considerably. In this case, the more efficient the fishing fleet was, the more rapidly the fish stock was destroyed. This is a classic mechanism for falling down the Seneca cliff: the more efficient you are at exploiting a non renewable (or slowly renewable) resource, the faster you deplete it. And the faster you get into trouble. This case, as others, is such a staggering disaster that one wonders how it was possible at all. How could it be that nobody in the fishing industry or in the government realized what was happening? In their article on this subject, Thurstan and his colleagues don't comment on this point, but we can cite an article by Hamilton et al. on the Canadian Atlantic Cod fishery, where they say "Some say they saw trouble coming, but felt powerless to halt it." That seems to be not describing not just the fishing industry, but our entire civilization.